It’s a celebration of frugality! Anderson provides viewers with real, practical money saving tips. Plus, see how to score on Anderson’s penny pincher quiz. It’s Anderson’s edition of life swap! Anderson gives one technology-addicted family the chance to unplug and experience the simple life, sending them to live on a farm with no electricity or running water. Today’s Anderson is all about overcoming fears. Anderson attempts to conquer his fear of heights by being suspended from the ceiling in his studio. Plus, real tips viewers can use to overcome fear are revealed. Due to the popularity of Anderson’s first food intervention show, another hour is devoted to everything food! Anderson speaks with Academy Award-nominee Mark Wahlberg about an epidemic affecting high school students. Current statistics reveal one-third of all high school students drop out before graduation. Plus, the amazing survival story of a teen gunned down by a peer as part of a gang initiation. On Wednesday evening, Anderson will host Elton John's 10th annual An Enduring Vision benefit event at Cipriani Wall Street in New York City. Please click here for the full article. Anderson Cooper has never been one to shy away from covering a dangerous story, so it was no surprise to see the CNN anchor in the heart of Tahrir Square in Cairo, covering the chaos of the spring revolution that would eventually topple Hosni Mubarak. Cooper was punched in the head 10 times by protesters but made it out of the country avoiding serious injury. It’s a good thing too, because the host of Anderson Cooper 360 (which just took over CNN’s coveted 8 p.m. time slot) recently launched his new syndicated daytime talk show, Anderson. Despite mixed reviews on its first day, the show has since picked up speed -- and viewers. During a year in which the media's lack of ethics was at the forefront of the news, it's more clear than ever that Cooper is one of the most important voices of the 21st century. Please click on link for more numbers from the week ending October 9th. Ask Anderson - What Are Your Favorite Things To Do In NYC? Ask Anderson - What Did You Want To Be When You Grew Up? 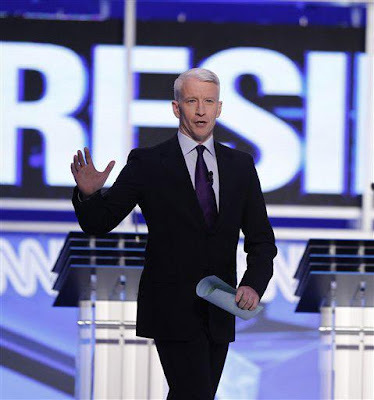 Anderson Cooper has been nominated for a People's Choice Award in the Favorite Daytime TV Host category. To vote follow this link. I really enjoy these Bits and Pieces posts because they catch you up on things you may have missed. Sorry to see Mark Wahlberg will be on Anderson's show--he's guilty of some behavior in the past that is despicable and as far as I'm concerned, he hasn't paid nearly enough for it nor has he shown any remorse for what he's done--I'm interested in seeing whether AC will broach that subject with him at all. Judging from the ratings, it doesn't look like Anderson's show will be around very long, although it also looks like most of the other talk shows ratings have dropped somewhat too and there are shows with similar ratings that still remain on the air. The New York Post had an article about how in spite of the low ratings, 'Anderson' is considered a modest success--lower expectations for today's talk shows post-Oprah. I think the talk show is hit or miss, but I'll continue to watch until it's cancelled--there's usually one or two shows a week that interest me. To be honest, there are aspects of the reporting and "contributors" on AC360 that I find more problematic and disturbing than some of the things presented on the talk show, but I also get the frustration and disappointment that many have expressed about it as well. Good thing anderson didn't come to any association teacher who was active in njea. We would have asked him where HE WAS during the battle in Wisconsin and then with Chris Christie. Obviously this teacher is a non-active member. We want someone to speak up for us on collective bargaining issues like Ed Shultz. When AC overtly supports labor he's welcome in NJ schools. So Anderson's over telling other people's stories? This week it seems to be all about him with celeb, Mark Wahlberg, thrown in for good measure. Guess we know what shows got the highest ratings. I guess he and his producer's have seen the ratings numbers spiral downward, too. People's complaints about Oprah toward the end was that her show had become too much about her; so this all about Anderson week may backfire. I know Anderson wanted to try something different and I applaud him for stepping out of his comfort zone, but it seems like he's done a total 180 and turned into someone I don't even recognize; including the clothes. I hope I'm wrong, but something tells me his producers are trying to make him into something he's not for ratings and he's buying it hook, line and sinker. What's appearing on my television and what's advertised for the coming week is not the way Anderson originally described the show. Again this week, in the Wednesday preview, they have him pretending to be afraid of snakes. This is the guy that had pet snakes as a child and asked to hold a rather large snake that was brought onto the AC360 set and let it slither around his neck while he threw to commercial with a smile on his face. The producers may fool some new fans, but the old fans know better and if anyone Googles Anderson Cooper snake, they'll know it's all an act... this just makes me sad. He may be the most successful new talk show this season, but that's not saying much given the competition. I think Katie could be the game changer next year. I so wanted him to succeed in his new venture, but unless some major changes are in the works, I don't see a hit, but maybe a mediocre daytime show at best. I really resent it that Anderson goes into a NJ school, pretending to be a friend of the common person, 'the teacher,' and yet not once did he ever mention labor during the collective bargaining issues that came up this year with Chris Christie. but ONLY to discuss labor disbutes and collective bargaining issues on behalf of NJ teachers. If I had been that teacher presented with his roses, I would have politely given them back and then asked: Where were you AC when COLA was taken away from NJREA? His veteran colleague, Solidad O'Brien spoke at the convention center in Atlantic City, just last year, on behalf of the teachers' association and SHE got a standing ovation, which was well deserved. I never thought Anderson would be such a phony!! If his show goes under a million, it deserves to be pulled. @aries moon...Well OF COURSE Anderson won't call Mark Wahlberg out on his past actions. After all, it's not about what he's done in the past, (that he hasn't apologized for...GOOD CALL ON THAT ONE)it's about what he's doing now. Why? Everyone can make mistake after mistake in their lives but at some point move on to become a decent person and do some good in our society. Sure...you can beat a woman (your celebrity partner)and be charged with domestic violence, physically fight with the press, buuut...over time IF GIVEN A CHANCE TO GO ON WITH YOUR LIFE, you can change the way you are perceived in the public eye and the press. You can become a philanthropist, "fight" for civil rights, and even win an Oscar. Hell you can even present "your buddy", Anderson Cooper, with a Press Club award. Women beating, press attacker??? Is that Chris Brown???? Oh wait that's Sean Penn...No when Chris Brown wants to go on with his life...he ends up on The Ridiculist. Anderson picks and chooses who to call out for their past transgressions...right along with the rest of society. I'm thinking despite his past attacks on INNOCENT people, Mark will get a pass too. How hard did Anderson come down on Eminem for using the word "fa...? Oh he didn't. @anon 5:40 am, you are right about how some people are able to slide by and move on with their lives without suffering the consequences of their actions. One of the main points of Anderson having a talk show was that he said he'd have a better ability to go in-depth with his guests, but as you pointed out, he may not be so inclined to bring up Mark Wahlberg's disgusting past actions. Why are people angry about an interview they have not seen yet? At least wait until you see the interview. They are annoyed at Anderson's choice of guest, for an hour! were 'on Watch What Happens Live,' with AC's friend, Andy Cohen tonite. I bring this up because of the ATA Sunday posts of R&K with AC as co-host, and both Mark and Andy are on the short list to replace Regis. The appointment will probably not take affect until 012, but I'm certain Disney has already made their selection. It is my opinion, that Anderson let this one just slide right by but...as always, JMO.